When we were getting ready to move to Alaska, people asked Kevin and me a lot of really stupid questions. Not, like, “Is it really dark there all winter?” More like, “Are you guys going to start doing meth?” This seems like a good opportunity to debunk (and, occasionally, confirm) the many Alaskan myths we were asked about before we started our journey to the Great White North. Will you be eating a lot of whale? I actually didn’t think this was a stupid question at all. In fact, as a longtime vegetarian, I was a little worried that my steady supply of local Boulder tofu would be replaced with a regular diet of whale steaks and puffin eggs. So, no, I have not yet been presented with an opportunity to eat blubber of any variety. But, for those of you who are interested, reindeer sausage is an extremely popular breakfast option. Do you have any plans to start a meth lab? Although we are living in beautiful, hopelessly redneck Wasilla, Alaska’s meth capital (out here, people use the term “Valley Trash” to describe couches on the lawn and similarly hillbilly-esque behavior), the closest we’ve come to cooking a batch of crystal is binging on Breaking Bad. Before you cease worrying, though, you should know: we are still essentially unemployed (I am getting paid in veggies, and Kevin is occasionally working at a dive called Klondike Mike’s–enough said), and we are surrounded by Sudafed retailers. If you look at a map, you’ll feel kind of bad for having thought Sarah Palin was such an idiot all this time. …Okay, probably not. But really, Alaska’s westernmost coastline is pretty close to to Russia. As the crow flies, however, Wasilla (where Sarah and I both live) is just over 700 miles from the eastern Russian coast. I have not run into any Palins, per se, but my landlord tells me that Sarah “shops” (read: pays someone to shop for her) at my grocery store, the Fred Meyer. Not Fred Meyer. The Fred Meyer. Will you be purchasing a gun? To clarify: this was not a stupid question. Literally everyone I know up here (with the exception of my cohort on the organic farm, a tiny pocket of Boulder-y goodness in what is otherwise a profound culture shock) is packing. Not just, “I carry a .22 in my purse.” These people are ready to take down a moose, if need be, as they walk through the grocery store parking lot. I saw a guy yesterday sling a rifle over his shoulder as he walked into a coffee shop. That said, we have no immediate plans to buy a gun. The closest thing I own to a weapon is a formidable-looking ice axe, and I plan to keep it that way. Will you be living in an igloo? Since we’ve been here, it has rained a few times and been cloudy most days, but it has not snowed. An indian summer is predicted, which I am hoping means sunshine through October. (I’m not holding my breath.) There is not enough snow to build an igloo here, and while I wouldn’t call Wasilla (or the Mat-Su valley in general) a cultural mecca, we do have some amenities. There are places to shop besides Wal-Mart. The Avett Brothers played here last week. There’s even a dog park. Will you ever eat produce again? 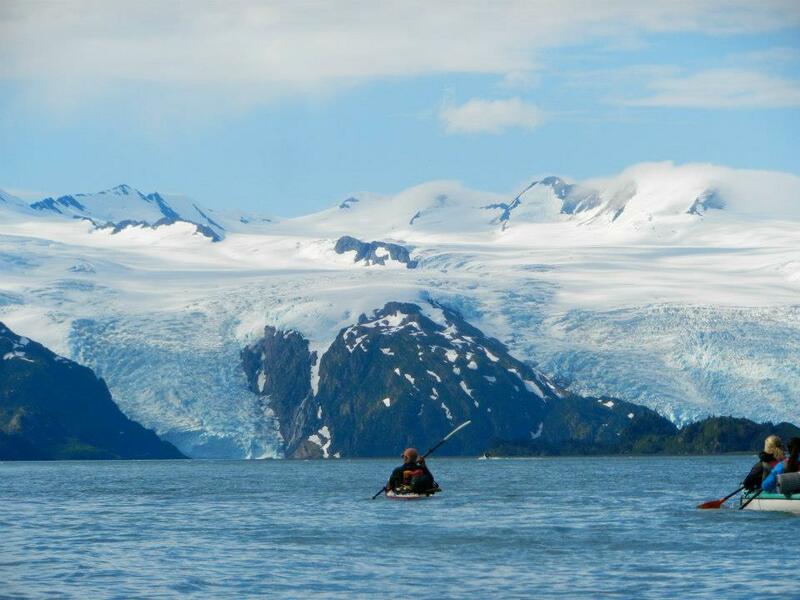 Sea kayaking in Blackstone Bay. Needless to say, there is no shortage of weirdness (or awesomeness) up here. It’s a bit of a culture shock for your average Boulderite, but it’s home for now, and many adventures lie ahead. Awesome, way to go, Emma.